Biology is studied by all girls up to and including GCSE Level. The aim of the department is to encourage students to take an interest in the living world and to think about the applications of biological science. We hope to foster a curiosity about science. A look at any newspaper or magazine will reveal how many areas of our lives relate to biology: gardening, sports science, global warming, genetically modified foods, cloning, stem cell research and the issues surrounding assisted reproduction are just a few of the important issues that our pupils will learn about in increasing depth as they move through the school. 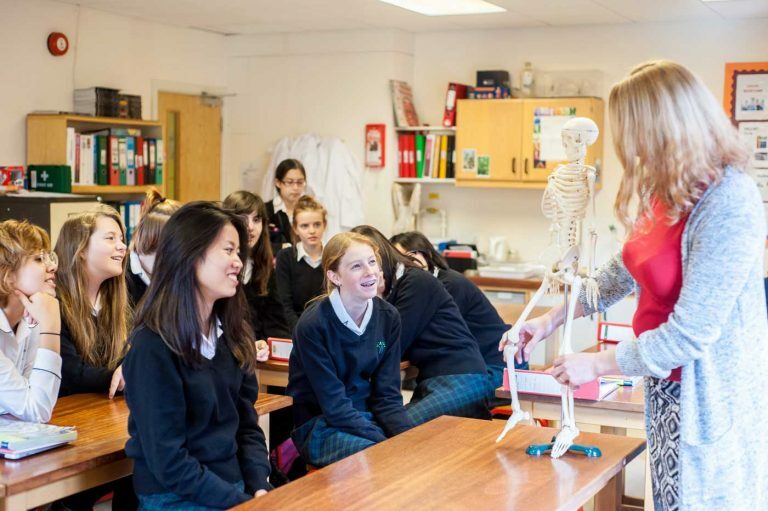 Whether they study biology at university or not it is our aim that Wychwood girls will be well informed and able to make decisions about important biological issues that they may meet in the future. Teaching involves practical work where this is appropriate, discussion, computer modelling and fieldwork. Pupils will often work in small groups but because class sizes are small they will also learn to have the confidence to complete practical and written work independently. 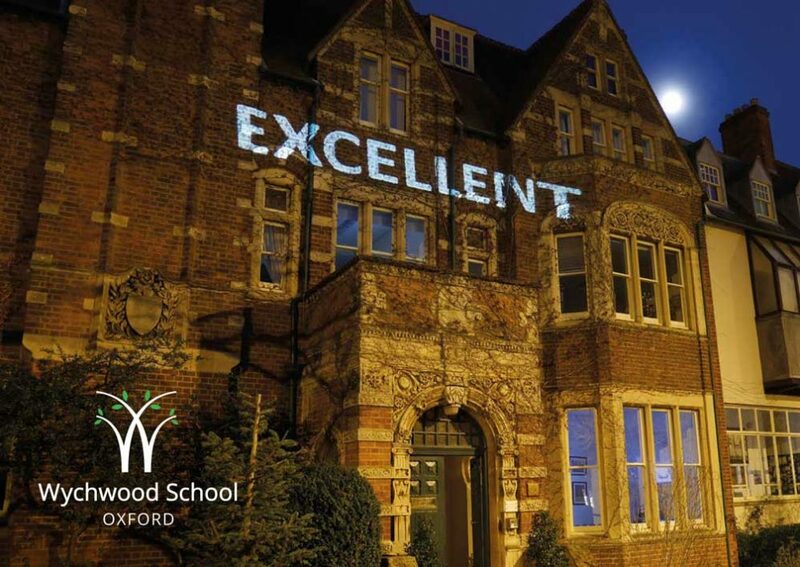 Wychwood School’s position near to the centre of Oxford means we can make use of the wonderful facilities offered by the University Museum of Natural History, Science Oxford and The University Botanic Garden. Our senior students can take part in free lectures offered at these centres and others. The biology department has in recent year played a significant role in the Eco-Schools project. Our bronze certificate has now been credited. 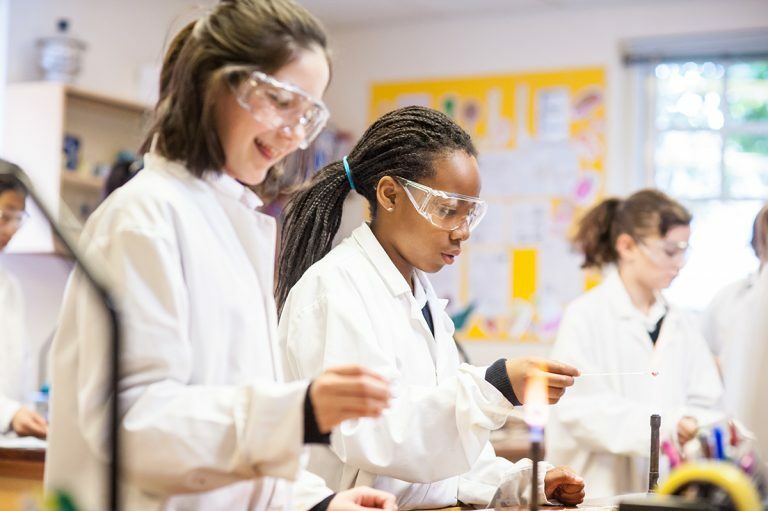 The GCSE course starts in Year 9 and then in Year 10 students are offered a choice of Double Award science following a combined science course (taught by subject specialists) that leads to 2 GCSEs or a Triple Award science course leading to three separate subject GCSE grades. Chemistry is studied by all girls up to and including GCSE Level. Chemistry is taught as a separate subject from the beginning at Remove (Year 7) through to A Level. We are very proud of our well designed and well equipped laboratory and the large proportion of the school that opt for Chemistry as a GCSE and A Level choice. We aim to inspire students with a love for the subject, an interest in the theory and a range of practical skills. The contribution of chemistry to intellectual development is great as the subject combines the skills needed for communicating ideas, both verbally and numerically, problem solving, and teamwork. Chemistry is essential to all those who wish to participate in debates in an informed way on subjects as diverse as the carbon economy, disposal of household waste, food additives, new materials and synthesis of medicines to name but a few. A flexible course for GCSE is followed in order to meet the interest and needs of all students. Throughout the course visits are used to give the topics a relevant context, for example a visit to Didcot Power Station, in connection with burning fuels and a visit to Iron Bridge in connection with extracting metals and iron and steel. The new 2016 syllabus for Chemistry provides relevant and interesting work for both the specialist wishing to continue with sciences for A Level and for those wishing to be well informed about the chemicals around them. The course contains material which leads to a large amount of related practical work in the lab, including experiments that illustrate the theory wherever possible and the planning and carrying out of investigations, which is assessed in school. The topics covered aim to emphasise both the relevance of chemistry to ordinary life by considering chemicals of industrial importance such as plastics, synthetic fibres and fertilisers and their impact on the environment as well as traditional reactions. The course consists of 10 modules taught over three years. Practical work is taught and developed over these years and tested through the final exams. There is also an option to cover Chemistry as part of the GCSE trilogy suite which results in the attainment of 2 GCSEs in Science. Computer Science is an option at GCSE Level. GCSE Computer Science is an exciting opportunity for the girls to engage in the world around them. It will allow them the opportunity to develop knowledge and understanding of the computing challenges arising from rapidly changing business and social environments and enable them to appreciate how computing is used in the real world. Girls will develop the skills to control devices rather than simply using software created by others. OCR GCSE computer science (J276) investigates how computers work and how they are used. It offers the chance to develop skills in computer programming and problem solving. This three unit course gives an in-depth understanding of how computer technology works and a look at what goes on ‘behind the scenes’. This course also introduces the girls to critical thinking, analysis and problem solving. Skills that can be transferred into other subjects and applied in day-to-day life. Divided into three units, two are assessed through a final written examination. Questions will be a mix of multiple choice, short and long answer. The third unit is a project that must be completed in school under supervision. This is an opportunity for the girls to demonstrate their ability, knowledge and skills gained through the course to solve a practical programming problem. What do I need to know or be able to do before taking this course as an option? Lessons take place in The Hall which is an impressive and adaptable space, allowing us to use different forms of staging and studio work, as well as having exciting contemporary sound and lighting systems. GCSE Drama encourages students to develop a variety of creative skills including acting, improvisation, analysis, group work and communication. The students will learn to respond to a variety of stimuli, encouraging the expression of ideas and meanings through the language of drama. They will explore a range of drama forms – recognising them in others’ work through group and individual activities. Script work will be used to aid understanding of how practitioners realise text in performance, as well as giving the student opportunity to develop her own performance skills. Performance of this devised piece or design realisation for this performance. Analyse and evaluate the devising process and performance. Performer or designer routes available. A devised performance/design realisation (15 marks, assessing AO2). Externally assessed by visiting examiner. Live theatre evaluation – free choice of production. Section A: Bringing Texts to Life. This section consists of one question broken into six parts (short and extended responses) based on an unseen extract from the chosen performance text. This section consists of two questions requiring students to analyse and evaluate a live theatre performance they have seen. EAL lessons are available for students whose first language is not English at any stage in the school, and are organised according to the needs of the individual. In the lower school, most students follow a general English course in order to consolidate grammar and develop vocabulary. Whilst studying for GCSE exams, students may also use the lessons to support their examination subjects. There may be a focus on essay writing, on discussion techniques or on building subject-specific vocabulary and practising examination-type questions. In Wychwood Sixth (Years 12 and 13), as well as support for A Levels, students will often follow an international examination course such as Cambridge Advanced or Proficiency, or the International English Language Testing System (IELTS) exam, which is required for university entrance. English Language is studied by all girls up to and including GCSE Level and English Literature is an option at GCSE Level. We run two English Language classes in order that the students’ specific academic needs are best met. GCSE English Language covers a wide and exciting range of written and oral skills. By the end of the course, students should be confident in writing everything from a simple CV to a complete short story. They should also be articulate, and prepared to listen to other people’s opinions as well as voicing their own.? ?Whilst not a combined course, as Literature is studied separately, a range of language and literature topics will be studied, with particular focus on pre 19th century text, in line with the unseen prose passage in the examination. Modern non fictional writing allows students to demonstrate their use of English in real-life contexts. 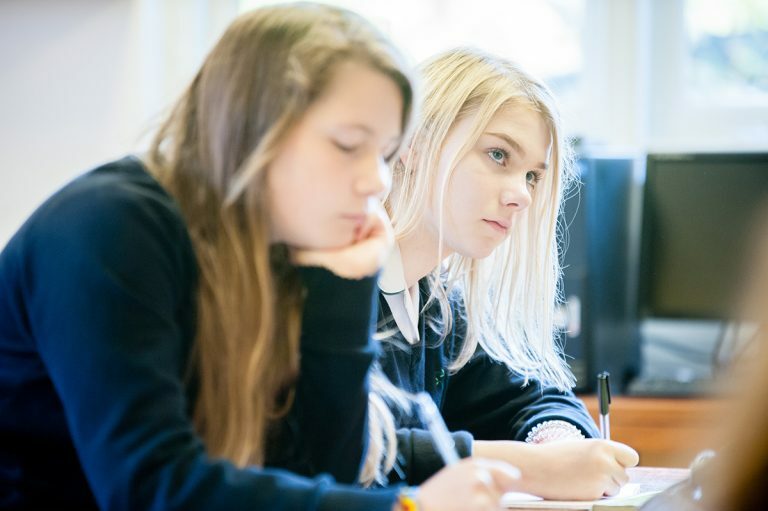 The GCSE English Literature course aims to encourage girls to read, understand and respond to a wide range of literature, drawn from contemporary and modern texts, and texts which have had a significant influence on our English literary and cultural heritage. Students will develop the skills necessary for literary study. Those who choose this course should be prepared to read widely and independently to strengthen their understanding and to acquire a more mature and fluent written style, both essential foundations for future advanced studies in English Literature. We take every opportunity to see productions of set and related texts in Oxford, London or Stratford. For GCSE English Language students will read fluently, and with good understanding, a wide range of texts from the 19th, 20th and 21st centuries, including literature and literary non-fiction as well as other writing such as reviews and journalism. These will be read and evaluated critically and comparisons will be made between texts. Students will summarise and synthesise information or ideas from texts and use knowledge gained from wide reading to inform and improve their own writing. They will write accurately, effectively and coherently using Standard English appropriately. Students will also be expected to listen to and understand spoken language, and use spoken Standard English effectively. The final mark and numerical grade of this linear course will be drawn from performance in two equally weighted examinations of 1 ¾ hours at the end of the Shell (Year 11) year. The reading and writing component of each paper has equal weighting. The first examination is on ‘explorations in creative reading and writing’ and aims to engage the students in a creative text and to inspire them to write creatively themselves. Please note that whilst the Spoken Language endorsement of this qualification will be reported on as part of the qualification, it will not form part of the final mark and grade. This specification must be taken alongside GCSE English Language. The course comprises the study of a Shakespeare play and a nineteenth century novel accounting for 40% of the overall grade and examined in a 1 ¾ hour closed book examination paper. Modern (from 1914 onwards) British fiction or drama, a poetry anthology from 1789 including representative Romantic poems and a response to unseen poetry accounts for 60% of the GCSE and is examined in a 2 ¼ hour closed book examination. The Love and Relationships poetry cluster featuring works by Byron, Shelley, Browning, Barrett Browning, Hardy, Bridges, Mew, Causley, Heaney, Armitage, Duffy, Sheers, Nagra and Waterhouse. Further poetry is studied in preparation for the response to unseen poetry. We encourage creative writing beyond the curriculum and run an annual ‘Charlotte Kell’ poetry competition. Winners are treated to afternoon tea at the Randolph Hotel and then choose a selection of books from a nearby book shop. Past winners have also gone on to win the BBC Wildlife Poetry Competition, and have been represented in the Foyle’s top 100 poets. We also mark National Poetry Day and World Book Day, with visiting author workshops and activities as part of our celebrations. There is always a creative writing competition to coincide with world book day, and we also have an annual poetry recitation competition. Girls across the school are invited to perform in the Rotary Youth Speaks public speaking competition. At Wychwood we have a long established and very successful Art Department within which the disciplines of Fine Art, Textiles, Photography and History of Art flourish providing an excellent base for the many students who go on to Foundation and Degree courses. We believe very strongly in encouraging pupils to develop their own personal styles of working and then to produce work that is a reflection of their own creative imaginations. Building confidence in the pupils’ own ability is essential, and the Wychwood Art Studios provide a safe, yet stimulating and knowledgeable environment, in which to discover just how much you can really achieve. Fine Art is offered as an option at GCSE Level. We teach in small or half classes, and the Art room and Study studios are enjoyable areas to work in, with a friendly and relaxed atmosphere. Pupils taking Art at GCSE can work in the Art room whenever they have free periods. Many pupils go on to Foundation and then Art Degree courses in a wide variety of disciplines, from illustration to costume design. The Art and Design Endorsed (Fine Art) GCSE is examined on a basis of 60% coursework completed throughout the 2 years during art lessons and 40% controlled test, which will be completed under supervision over a total of 10 hours during the Hilary and Trinity term of the Shell year (Year 11). The syllabus is based on a strong core of 2D work, painting and drawing in a variety of materials to develop a wide range of technical skills. The traditional language of art and design: line, tone, form, texture, colour, etc., will be explored, and the use of sketch books form an important part of the course. Visits are made to galleries and museums, either as a starting point for project work or where the exhibition is thought to be a valuable experience for any pupil working in this area. Some history of art will be studied to cultivate an appreciation of painting and drawing from different periods and cultures. Pupils will be required to produce a portfolio of work over the 2 years from which 2 projects will be submitted, each consisting of sketches, studies, paintings and allied material. The further 40% of the final grade comes from an externally set project, allowing a theme, title or question to be developed by the pupil alone, in a range of media. All the submitted work is marked internally in the Trinity term and then moderated externally by a visiting Moderator/ Examiner from the board. The GCSE syllabus encourages pupils to work in much greater depth on a project than before, thinking, researching and planning for themselves. Consequently girls develop a strong and confident personal style. This mature approach to the subject leads naturally on to ‘AS’ and ‘A’ Level Art and Design and beyond, to degree level work. Geography is offered as an option at GCSE Level. The study of geography helps make sense of the beautiful, complex and dynamically changing world and prepares pupils for roles as global citizens in the twenty-first century. Geography stimulates an interest in, and a sense of wonder about places. It explains how places and landscapes are formed, how people and environments interact, and how a diverse range of economies and societies are interconnected. It builds on pupils’ own experiences to investigate at all scales from the personal to the global. Geographical enquiry encourages questioning, investigation and critical thinking about issues affecting the world and people’s lives, for the present and future. Fieldwork is an essential element of this. Pupils learn to think spatially, using maps, visual images and new technologies, including information systems, to obtain, present and analyse information. Geography inspires pupils to think about their own place in the world, their values and responsibilities to other people, to the environment, and to the sustainability of the planet. There are four areas to the course: Living with the physical environment, Living in the human environment, Geographical applications and Geographical skills. Each of the first two areas will be assessed by way of a written examination of 1 hour 30 minutes, with each paper being 35% of the overall qualification. The Geographical applications will be assessed through a 1 hour written examination, which accounts for the remaining 30% of the course. The Geographical skills will be assessed across the three written papers. The examinations will include a mixture of question types including multiple-choice, short answer, levels of response and extended prose. The specification will be taught linearly with the physical environment occupying the Upper Transits (Year 10) and the human environment in Shell (Year 11). The girls will also complete two geographical enquiries, which will include collecting primary data outside the classroom and the school grounds in contrasting environments. Click here for further course information. History is an option at GCSE Level. The pupils are encouraged to see history as an investigation, requiring the study of source material and an open mind that can begin to appreciate that events usually have more than one cause and often a variety of interpretations. At GCSE we study 4 separate units, which are examined in two assessments: Britain: Health and the People; Elizabethan England, 1568-1603; Russia 1894-1941; and Conflict between East and West, 1945-72. This offers a mixture of periods and approach and so each pupil can find at least one unit they particularly enjoy. There are opportunities to visit historical sites such as Hardwick Hall and Warwick Castle, as well as exhibitions at the Imperial War Museum. There are historical plays that can be watched on subjects such as the Great Plague. Britain: Health and the People. In this study the pupils will gain an overview of the main changes and the trends in medicine and public health in Britain from 1100 to the present. We will study key individuals such as Pasteur and Fleming and look at the different factors that enabled them to make their contributions. We consider issues such as war, religion, technology and government, and evaluate the importance of these in the history of medicine. Elizabethan England, 1568-1603. This concentrates on various aspects of the government, life and culture of the England of Elizabeth I. We will explore and appreciate the important characteristics and dynamics of the period. This study offers a contrast of cultures, not only between rich and poor within the period, but also between the Elizabethans and ourselves. The students will also be examined on a specific site, such as a Tudor manor house, which will enrich their understanding of Elizabethan England. Russia 1894-1945: Tsardom and Communism. This period study focuses on the development of Russia during a turbulent half century of change. It was a period of autocracy and communism – the fall of the Tsar and the rise and consolidation of communism. Conflict and Tension between East and West, 1945-72. This wider world depth study focuses on the causes and events of the Cold War and seeks to show how and why conflict occurred and why it proved difficult to resolve the tensions which arose between America and the Soviet Union. This unit builds on the students’ knowledge of Russia from the previous unit. History encourages students to be active learners and hopefully broadens their understanding of both the past and present day events and as such it is particularly useful for anyone considering a career in Journalism or Law. The most important reason for choosing this subject should be a real interest in investigating key events and individuals and I look forward to watching girls become increasingly confident and knowledgeable as the course progresses. Mathematics is studied by all girls up to and including GCSE Level. Girls are prepared for the Edexcel International GCSE in Mathematics, following the Mathematics A course. The content is similar to GCSE Mathematics, but with less emphasis on Statistics and more on Algebra and related topics. There are two tiers of entry, Foundation and Higher. It is expected that usually most girls will be entered for the Higher Tier examinations. Assessment is currently through two examinations taken at the end of Year 11. There are no controlled assessments for the International GCSE in Mathematics. There are two teaching groups for Mathematics. The decision on which teaching group is most suitable for each girl will be made at the start of the Lower Transit year, but it will be reviewed regularly in the light of later progress. Changes are made when an individual girl would benefit from being in a different group. The decision on which teaching group is most suitable for any new pupils will be based, initially, on the result of their entrance paper. Modern Foreign Languages (French and Spanish) is studied by all girls to GCSE Level. We offer German on demand and have the services of a German tutor. We also offer tuition in other languages on demand. Believing that for the best communication there must be a real understanding of the foreign culture and environment, as well as the language, we want to encourage a lively and positive approach, so that students will use their skills practically in authentic situations. This will be supported by parallel encouragement of traditional linguistic skills. 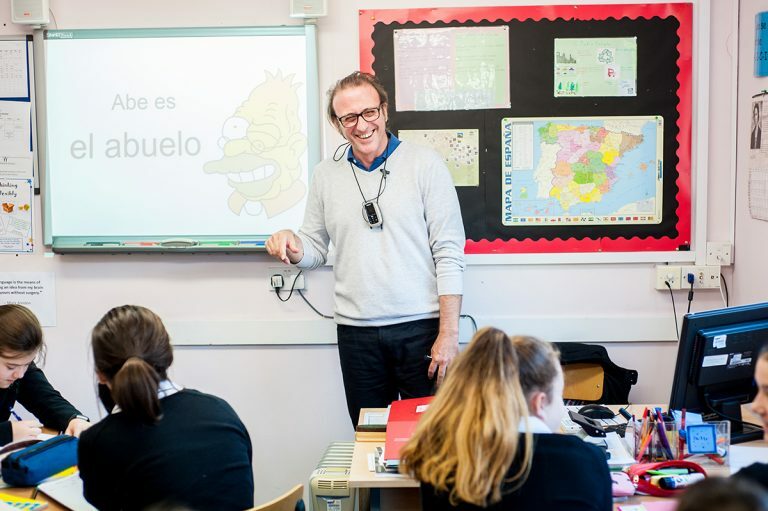 We expect that a pupil will attend the trips that we organise to France and Spain on a regular basis, as this will bring the language to life. The GCSE in Modern Languages has as its chief aim the development of the ability to use the language effectively for communication.? ?The four skill areas on which teaching, learning and testing are based are listening, speaking, reading and writing; these are given equal weighting and emphasis. Why should I study a Modern Foreign Language? French and Spanish are worth studying in their own right. They are challenging but interesting. A foreign language can enhance your chances for a career in industry, commerce, management, fashion, diplomacy, and bilingual secretariats or PA posts. If you would like to work abroad, do not forget that French is spoken not only in the core area (France and neighbouring Belgium, Luxembourg and Switzerland) but also in parts of North America and the Caribbean, many African countries, and even in southeast Asia and the Indian and Pacific Ocean islands. Spanish is spoken not only in the core area (Spain and the neighbouring Balearic and Canary Islands) but also in most of Latin America and several regions of the United States. Music is offered as an option at GCSE Level and as a BTEC. To study GCSE music you must play an instrument or sing at Grade 4 level. Candidates study the Edexcel specifications at GCSE Level. The BTEC is equivalent in size to one GCSE. It is designed for pre-16 students who want to include a study of the music industry in their broader Key Stage 4 curriculum. Students will engage with music as an industry and will develop a range of relevant practical and technical skills. The exam has 3 parts: Performing, ?Composing, Listening and Appraising. Performance involves both solo performance and performance as part of an ensemble (duet or trio). Composition is studied and during Year 11 two of your own compositions need to be performed and recorded, the CD being sent to the moderator. The written exam is based on four areas of study. It includes eight set works and questions on unfamiliar pieces. The areas of study are: Instrumental music 1700-1820, Vocal music, Music for Stage and Screen and, finally, Fusions. Click here for further GCSE course information. The qualification consists of two mandatory units. An additional two units are then chosen from a choice of five optional units. This unit provides an overview of the music industry. It covers the fundamental knowledge and understanding of music industry organisations and the roles and responsibilities of those that work within them. This unit requires pupils to plan, develop and deliver a music product, by undertaking basic business planning activities, research and marketing as well as the promotion and running of an event or launch of a product. This qualification will be an exciting exploration into the music industry. It is designed to be taken as part of a broad and balanced curriculum at Key Stage 4. It will go well with other GCSE subjects to provide both curriculum breadth and the skills needed to make informed choices about study at post-16 level. Click here for further BTEC course information. Photography is offered as an option at GCSE Level. Photography is a popular subject with students achieving outstanding results and grades both at GCSE and A Level. Students explore ideas through sustained investigations, which include techniques both with traditional processes and through digital methods. The photography department is well equipped and students can expect to have access to range of digital programmes and applications. Photography students are expected to provide their own SLR type camera (Digital or Analogue type). There are regular visits to Photography exhibitions and practical on-location trips where students can extend their technical understanding. Photography is a practical course which provides pupils with the opportunity to demonstrate their understanding of the subject in a wide variety of contexts. Using school facilities, the pupil will be able to enjoy the whole process of photography from initial shooting through to the final development in the dark room and on the computer using photoshop. GCSE Photography can provide a foundation for A Level study in the subject, a valuable skill useful in other visual arts and/or an exciting interest that can be carried on in later life. Girls will need their own SLR camera preferably digital with a UV filter. We follow the AQA GCSE Physical Education syllabus which covers a wide range of theoretical as well as practical elements. The theoretical side consists of two written papers, which is taken at the end of the course, carrying 60% of the total mark. The practical unit is assessed in both Year 10 and Year 11 as a continuous practical assessment. You must choose three practical sports to be assessed in over the course. These must include one individual sport and one team sport. The third assessment can be either an individual sport or a team sport. Pupils need to be capable of taking part in a wide range of sporting activities at a good standard. As well as having enthusiasm and keenness to learn about all aspects of an activity is necessary. This could involve playing in a school team, umpiring games or organising teams, among other possibilities. It is highly encouraged that they also take part in one or more sports at a higher level, which should take place outside of school in a club or recreational activity. The Physical Education course overall could be an asset to anyone wanting a career in many sport related professions, the leisure industry or primary/secondary teaching. At Wychwood, physics is delivered by specialist teachers in a way that engages and challenges the girls. In the Lower Transits (Year 9) the girls begin their science GCSE course. During the following two years girls can opt to study for a double or triple AQA physics GCSE. We have a strong uptake at this level. The GCSE Physics qualification consists of 4 modules. Practical skills are examined in the written examinations, but pupils are still expected to carry out a series of required practicals that are externally endorsed. Click here for further course information. Psychology is offered as an option at GCSE Level. Psychology fits well with both arts and science GCSEs. Studying psychology works well for anyone who is interested in human behaviour and the way the brain works. Each component also includes a section on research methods. Religious Studies is studied by all girls up to and including GCSE Level. The GCSE short course builds on the knowledge, understanding and skills established in Religious Studies in years 7, 8 and 9. This course includes the study of two world religions and the exploration of important ethical issues. It will also give the students an opportunity to develop and express their views through discussion, debate and reasoned essay writing. Girls will study the Edexcel Short course B. Textiles is offered as an option at GCSE Level. Students will be introduced to a variety of creative fabric techniques. Traditional textile techniques will be studied and applied to the project coursework, for example: quilting, resist dying, printing, fabric painting, appliqué, machine and hand stitching. The focus of the course encourages research and development of ideas through a variety of creative processes and students need to research the subject from a historical, cultural and contemporary perspective. Throughout the two years students are encouraged to develop a personal style involving research and exploration of ideas and a processing of these ideas into resolved textile pieces. A number of trips to exhibitions are undertaken during the two years. A materials fee of approximately £40 per term covers additional materials. Biology is offered as an option at A Level. Teaching involves practical work where this is appropriate, discussion, computer modelling and fieldwork. Pupils will often work in small groups but because class sizes are small they will also learn to have the confidence to complete practical and written work independently. In the sixth form we complete a very popular field trip and in recent years we have visited Dale Fort in Pembrokeshire and Eagles NestField Centre in the heart of The Cevennes region of France. The A Level Biology course cannot supply answers to all the questions raised. It does, however, provide a background from which to study them, understand present ideas and hopefully reach an informed viewpoint. The course involves a study of the main chemicals in the cell, providing an introduction to biochemistry and emphasising how all life on earth follows a similar pattern. The cell itself is studied in detail and then how cells are specialised to form the different organs in animals and plants. Genetics considers the laws governing inheritance and what we know about the structure of the gene, whilst evolution involves some of the great ideas in biology and provides a unifying principle for the subject. There is slightly more emphasis on animals and human health and disease than on the plant kingdom and this seems to reflect the bias shown by many biology students. The subject is a technical one and draws on parts of chemistry, geography and mathematics. It is also a practical subject and involves microscope work and experiments in the laboratory as well as a field trip to study organisms in their natural environment. Dissection is no longer compulsory. We are fortunate to be in Oxford, where visits to University lectures, botanical gardens and museums can all help to keep us up-to-date. Click here for further information about the course. Biology can be studied with almost any other A Level subject and may lead on to many different careers in science, business and the arts, since it always serves as a valuable A Level. It is hoped that this course will give girls an interest for life, as well as an important qualification to prepare them for a rewarding career in the 21st century. Former students have gone on to study medicine, veterinary science, chiropractics and other sciences at university. The Extended Certificate is for students that are interested in learning about the business sector alongside other fields of study, with a view to progressing to a wide range of higher education courses, not necessarily in business-related subjects. It is designed to be taken as part of a programme of study that includes other appropriate BTEC Nationals or A Levels. It is equivalent to one A Level. The course comprises of four units of study, 3 of which are mandatory. In this introductory unit, students study the purposes of different businesses, their structure, the effect of the external environment, and how they need to be dynamic and innovative to survive. This is a mandatory unit, assessed internally. Students study the purpose and importance of personal and business finance. They will develop the skills and knowledge needed to understand, analyse and prepare financial information. This unit is assessed externally through a written exam. Students will explore how the recruitment process is carried out in a business. The unit gives students the opportunity to participate in selection interviews and review their performance. Chemistry is offered as an option at A Level. We aim to inspire students with a love for the subject, an interest in the theory and a range of practical skills. The contribution of chemistry to intellectual development is great as the subject combines the skills needed for communicating ideas, both verbally and numerically, problem solving, and teamwork. Chemistry is essential to all those who wish to participate in debates in an informed way on subjects as diverse as the carbon economy, disposal of household waste, food additives, new materials and synthesis of medicines to name but a few. The A Level course contains plenty of opportunities for practical and extended research. Chemistry is a fascinating subject, combining a large amount of practical work with problem solving skills and relevance to every day life. The AQA specification allows students to look in depth at topics encountered first at GCSE as well as introducing new and exciting aspects of Chemistry such as reaction mechanisms and organic synthesis. Practical work is an integral part of the course and students are given ample opportunities to develop and refine their skills. A level chemists keep a laboratory book which is a contemporaneous record of the experimental work they carry out. Practical skills are demonstrated over 5 key areas both in lessons and through examination during the final exams. A Level chemistry students also have the opportunity to participate in competitions, attend conferences and take part in outreach projects. Drama and Theatre Studies is offered as an option at A Level. Coursework, 40% of the qualification. Content overview: Devise an original performance piece. Use one key extract from a performance text and a theatre practitioner as stimuli. Performer or designer routes available. A portfolio which can be handwritten/typed evidence between 2500-3000 words or recorded/verbal evidence between 12-14 minutes. Externally assessed by a visiting examiner. Live theatre evaluation – choice of performance. Practical exploration and study of a complete performance text – focusing on how this can be realised for performance. Practical exploration and interpretation of another complete performance text, in light of a chosen theatre practitioner – focusing on how this text could be reimagined for a contemporary audience. Students answer one extended response question from a choice of two requiring them to analyse and evaluate a live theatre performance they have seen. Students answer two extended response questions based on an unseen extract from the performance text they have studied. Students will demonstrate how they, as theatre makers, intend to realise the extract in performance. Students answer from the perspective of a performer and a designer. Students will answer one extended response question from a choice of two based on an unseen named section from their chosen performance text. They will demonstrate how their re-imagined production concept will communicate ideas to a contemporary audience. Students will also need to outline how the work of their chosen theatre practitioner has influenced their overall production concept and demonstrate an awareness of the performance text in its original performance conditions. Economics is offered as an option at A Level. You may not have studied any business or economics related subjects before, but that does not matter! You would be expected to have achieved Grade C in English and Maths as a minimum requirement. The Advanced GCE in Economics B is structured into four themes and consists of three externally examined papers. Breadth and depth of knowledge and understanding with applications of the more complex concepts and models are developed in the second year of study using the themes studied in the first year. Theme 1 – Markets, consumers and firms. In this theme, students explore the way in which consumers make choices and entrepreneurs create desirable products. Other concepts explored are scarcity, the role of credit in our society and how the government intervenes in the economy. Numerical aspects include the calculation of profit and revenue. Theme 2 – The wider economic environment. This theme helps students to explore how firms can become more competitive. It introduces them to the wider international and economic environment in which firms operate. Within this theme we will also be exploring the macro-economy and influences upon it. Theme 3 – The global economy. This theme builds on the content of theme 2 and continues its focus on the international economic environment. Globalisation is explored and the impact on the world’s global businesses and local and national economies. Students will study the effect and causes of inequality and the economic policy responses to different situations. Theme 4 – Making markets work. This theme starts by considering degrees of competition within markets and then encourages students to apply their understanding to how governments may improve the functioning of markets and the economy. Economics complements a number of subjects on the curriculum and an understanding of economics is relevant to advanced study in subjects such as History, Politics, Sociology, Philosophy, English and Geography. Students considering reading Economics at university should ideally take Mathematics at A Level, however, there are a wide range of courses that would suit students from a wide range of academic backgrounds. Many careers require an understanding of key economic concepts such as law, journalism, public policy, diplomacy, education, environmental science, medical administration and international affairs. Advice and information on building a strong platform for applications to the UK and overseas universities, by Geoff Riley FRSA. English Literature is offered as an option at A Level. English Literature is a ‘facilitating subject’ for the purposes of University applications and it remains a compulsory subject in many schools. In order to study English Literature at A Level, students will need to have followed the GCSE course. Why should I study A Level English Literature? We hope that, after the two year course with us, girls will have acquired the ability to pass the A Level examination with a very high grade. They will also have developed an awareness of the English literary tradition, skills in critical analysis and an enjoyment of great literature which will serve them for the rest of their lives. Much of the work done during the Upper Transit and Shell years (Years 10 and 11) is a foundation for A Level. The syllabus requires the study of 8 texts, with an emphasis on pre 1900 texts as well as post 2000 texts. External assessment accounts for 80% of the full A level with three terminal examinations in Drama, Prose and Poetry. In the latter a response to unseen modern poetry is a compulsory requirement. The further 20% of marks is drawn from a Coursework task. The text is at the heart of the syllabus with a clear focus across the three main genres, and a clear and distinctive approach to Literary criticism. In drama students study a Shakespearean Tragedy, ‘Othello’ as well as the genre of Tragedy through critical essays and commentary related to this. A further pre 1900 Drama text, ‘The Importance of Being Earnest’ by Oscar Wilde is also be studied. Two prose texts are studied with a focus on Women and Society. The pre 1900 Hardy text ‘Tess of the d’Urbervilles’ will compare conditions and expectations of women in rural Victorian England with those of women in post 2000 Afghanistan and the 20th century history leading up to this through Khaled Hosseini’s text ‘A Thousand Splendid Suns’. In poetry lessons students study Larkin’s ‘The Less Deceived’ and practise responding to a selection of modern (post 2000) poetry in preparation for the synoptic aspect of the examination. Practical Criticism is taught across both years. There is also an extended comparative coursework essay of 2500 – 3000 word referring to two texts. We take every opportunity to see productions of set and related texts in Oxford, London or Stratford and, where possible, attend conferences held in London which enable the students to hear lectures from leading academics. However, the main focus of the course is written work and we also expect independent reading and research. Weekly essays and other written pieces are set and during the course the girls are helped to develop a fluent and mature written style and an ability to construct relevant, detailed and cogent arguments. These are skills which are invaluable at University level for many subjects. We hope to teach by a constant but almost imperceptible refining of students’ responses through written work and discussion. Students are encouraged to understand and challenge their own responses and gradually lessons become an opportunity for exchanging different attitudes and ideas. We think that, with growing confidence and experience, our students are able to approach the examinations prepared in both factual content and attitude, with confident critical skills and secure written expression. We have been delighted with the level of passes and high grades achieved in the past, but we are pleased most of all by those girls who have appreciated and enjoyed their studies here. Fine Art is offered as an option at A Level. Component 1 – Coursework – Practical work and outcome linked to a personal written study of 1000 – 3000 words. We teach in small or half classes, and the Art room and Study studios are enjoyable areas to work in, with a friendly and relaxed atmosphere. The A Level groups have the opportunity to attend Life classes locally, and girls have their own work areas that are theirs to use at anytime. Many pupils go on to Foundation and then Art Degree courses in a wide variety of disciplines, from illustration to costume design. Component 2 – Externally Set Assignment – As Unit 2 but a 15 hour timed examination piece is produced. Students keep a work journal throughout the course, a combination of sketchbook and time-based record, showing evidence of the development of their ideas with reference to the work of other artists, and showing their understanding of meanings and their ability to make skilled judgements in visual and verbal form. Those pupils who have done GCSE Art at Wychwood will have developed strong sketchbook skills which reflect their own individual approaches and these will stand them in good stead for A Level and beyond. The Study groups have their own studios, with each pupil having her own personal work space. These are always open. The development of a strong and confident individual style in a wide variety of materials is very important. The standard required is high, and students need to be self motivated and able to work independently. Only students with above average ability and a real desire to work at the subject are encouraged to embark on these courses. Why should I study A Level Fine Art? Many pupils go on to Foundation and then Art Degree courses in a wide variety of disciplines, from illustration to costume design, and over the years students have taken up places at Heatherlys, Leeds, Oxford Brookes and the Royal drawing School amongst others. Geography is offered as an option at A Level. The new specification (September 2016) has retained many of the popular topics from the old specification, such as hazards and population, but it also contains new units of study that reflect the current issues in today’s world. Develop a specialist interest within the field of geography, and progress to higher education and employment. Students complete an individual investigation of between 3000 and 4000 words, which must include data collected in the field. The individual investigation must be based on a question or issue defined and developed by the student relating to any part of the specification content. The specification will be taught linearly with the Hazards, Coastal Systems and Landscapes, and Changing Places occupying the first year and the remaining units of study being covered in the second year. Students will also undertake four days of fieldwork during their A-level course, which can be completed in a number of ways: locally or further afield, on full days or on part days. The first two components of the course will each be assessed by way of a written exam lasting 2 hours 30 minutes, with each paper contributing 40% towards the A-level. The third component will account for the final 20% of the A-level, and will be marked internally before being sent to the examinations board for moderation. Why should I study Geography? Geography at A Level allows an in-depth study of subject matter, which is topical and wide-ranging thus providing a useful basis for a variety of career choices. History is offered as an option at A Level. The pupils are encouraged to see history as an investigation, requiring the study of source material and an open mind that can begin to appreciate that events usually have more than one cause and often a variety of interpretations. At A Level we cover a selection of topics such as Britain 1951-97, Communist Russia, Rebellion and Disorder under the Tudors, and the Cold War. There are opportunities to visit historical sites such as Hardwick Hall and Warwick Castle, as well as exhibitions at the Imperial War Museum. There are historical plays that can be watched on subjects such as the Great Plague. At A Level we attend conferences in London where historians present lectures and take questions from the audience on key topics. The A Level course consists of four units. External assessment of three units at the end of Study 2 (Year 13) accounts for 80% of the full A level, with a coursework essay worth 20% of the marks. Unit 2 is a non-British period study, and for this we look at Russia from 1894-1941. We will cover the last years of the Romanov dynasty, the impact of the changes caused by industrialisation and the First World War, the Bolshevik Revolution and concluding with the impact of Stalin’s rule. Unit 3 is a thematic study over 100 years. We investigate Rebellion and Disorder under the Tudors 1485-1603. This theme focuses on the causes, nature and extent of disorder in England and Ireland during this period. There will also be three depth studies into the Pilgrimage of Grace, the Western Rebellion and Tyrone’s Rebellion. The girls are encouraged to assess the significance of events, ideas, attitudes and beliefs, and how they influenced behaviours and actions. Unit 4 requires the students to undertake an historical enquiry, and we will study 20th Century Superpower Relations, c1941-90. This topic builds on their knowledge of Russia in Unit 2, and looks at why the Cold War emerged and why it came to an end. As a class we will cover the general details of the topic and then each girl will select an issue or event to research. They will write up their choice as a 4,000-word essay that will be marked by the teacher and then moderated by OCR. At Wychwood we have a long established and very successful Art Department within which the disciplines of Fine Art, Textiles, Photography and History of Art flourish. History of Art is offered as an A Level option. History of Art is an academic and essay-based subject. The course assumes no previous knowledge of art history and requires no practical artistic skills. It is suitable for a wide range of students who wish to develop their interest in, and enjoyment of, the study of History of Art, fostering its value in lifelong learning. It includes work from beyond the European tradition and this new specification introduces a global aspect that is appropriate for the modern world. We are fortunate to be situated close to the heart of Oxford so that work covered in the classroom can be supplemented by frequent visits to galleries, exhibitions, lectures and architectural sites in the city. We also travel to London and further afield on an annual study trip abroad because studying works at first hand is a vital part of this subject. In 2017 we visited Paris and plan to visit Rome in 2018. Students answer a single compulsory question that requires them to comment on an unseen photograph of: a painting, a sculpture and a building. Two Themes: Nature in art and architecture; and Identities in art and architecture. For each Period, students answer a single compulsory question in four parts. This subject works well in combination with virtually any other subject, in particular History, English, Languages and the Arts. In terms of University entry, this subject equips students with a number of transferable skills including critical and analytical competencies, a valuable asset for most undergraduate courses as well as a sound cultural understanding. Universities respect the intellectual rigour and academic discipline of the subject. Many students go on to study History of Art at university. Careers can be found in galleries, museums, auction houses and publishing. It is an excellent subject to consider if aiming for a career in the creative and cultural industries, including architecture, design, film or advertising. Even if this subject is not pursued at university, it will open students’ eyes to a lifetime of critical analysis of the art and architecture in the world around them. Mathematics is an option at A Level. Mathematics is a popular option in Wychwood Sixth. A Level Mathematics is accepted toward the entrance qualifications of a wide range of courses, and is a requirement for a few. It is also well thought of by many employers. However, it is also important that anyone who starts the course finds some enjoyment in studying the subject.?? Most aspects of the GCSE course will be met at a higher level in the A level course though it is particularly important to have a good grasp of the algebra and trigonometry studied at GCSE. It is expected that those who join the course will have achieved a grade A in the Higher tier GCSE course. A successful student will develop her ability to reason logically and to analyse problems and apply mathematical methods to solve them. Some of the problems will be set in the context of the ‘real world’, and the technique of mathematical modelling will be explored and used to allow their solution. As the course continues, the relations between the many different techniques first met at GCSE will become clearer, and the unity of the subject will become more apparent. If there is sufficient demand, AS and A Level Further Mathematics courses are also run. A Level Mathematics is accepted toward the entrance qualifications of a wide range of university courses, and is a requirement for a few. It is also well thought of by many employers. The most important reason for studying Mathematics is the fascination of the subject, which is neither a science nor an art, and it is important that you find some enjoyment in learning more about the concepts and methods. Most aspects of the GCSE course will be met at a higher level in the A Level course though it is particularly important to have a good grasp of the algebra and trigonometry studied at GCSE. It is expected that those who join the course will have achieved a grade 7 or above in the Higher tier GCSE course. This subject is linear and the new specification was first taught in September 2017. There are no longer individual units for the course. There is a common course that has to be studied which includes Pure Mathematics, Statistics and Mechanics. At the end of the course there are three 2 hour papers; Papers 1 and 2 are both on Pure Mathematics and Paper 3 is on the Statistics and Mechanics topics. The total marks for all 3 papers is 100 and each paper is worth a third of the qualification. The Pure Mathematics topics extend the algebra, co-ordinate geometry and trigonometry studied up to GCSE and introduce new topics such as calculus and logarithms. Statistics is used by students of biology, economics, geography, and psychology. The topics studied will build on ideas already met at GCSE as well as new topics such as statistical distributions and hypothesis testing. Mechanics is the application of mathematical methods to specific problems in Physics. This builds on topics such as kinematics which have already been met at IGCSE as well as introducing forces and Newton’s Laws of Motion. Further Mathematics is taken in addition to A Level Mathematics, not as a separate subject. There is still some flexibility in the choice of units to make up the course, so the information below gives what options girls might take. It is expected that those who join the course will have an A* grade at GCSE. The course has four one and a half hour papers, the total marks for each paper is 75 and each paper is worth 25% of the qualification. Paper 1 and 2 are both compulsory and are called Core Pure Mathematics 1 and 2. There is a first option, which can be chosen from Further Pure Mathematics 1, Further Statistics 1, Further Mechanics 1 and Decision Mathematics 1. The second option can be chosen from Further Pure Mathematics 2, Further Statistics 1, Further Statistics 2, Further Mechanics 1, Further Mechanics 2, Decision Mathematics 1 and Decision Mathematics 2, but there are restrictions on which papers can be taken together. Modern Foreign Languages (French and Spanish) is an option at A Level. We offer German on demand and have the services of a German tutor. We also offer tuition in other languages on demand. A Level students are required to demonstrate their knowledge of contemporary society. Consequently, we believe it is necessary for all students to spend as much holiday time as possible abroad, preferably with a francophone family. A number of organisations specialise in linguistic stays and we can advise you on the various possibilities. These visits should take place during the summer before the beginning of the course and, for those taking an A Level, preferably again during the following summer. All students should appreciate this requirement before embarking on the course. Current issues and multiculturalism in Hispanic society and aspects of Political life in the Hispanic world. Film ‘Volver’, ‘Las trece rosas’ and ‘Ocho apellidos vascos’. French and Spanish are worth studying in their own right. They are challenging but interesting. A Level builds on work that you will have met at GCSE and introduces new ideas and concepts. It serves as a very useful support for many other qualifications, as well as being a sought-after qualification for the workplace and courses in Higher Education. A Modern Foreign language qualification is acceptable for virtually all University subjects, not only the obvious Language, Literature and Applied Language courses. It will often be a requirement or an option in the following courses: management and business studies, administration courses, travel and tourism studies. In science-based subjects (especially medicine, pharmacology and other biological sciences, not to mention recent developments in computing), many relevant papers are published in French or Spanish. Knowledge of a European language will weigh heavily in your favour when applying for either an Erasmus or Comet Grant for a year of study abroad. Music is offered as an option at A Level and as a BTEC. 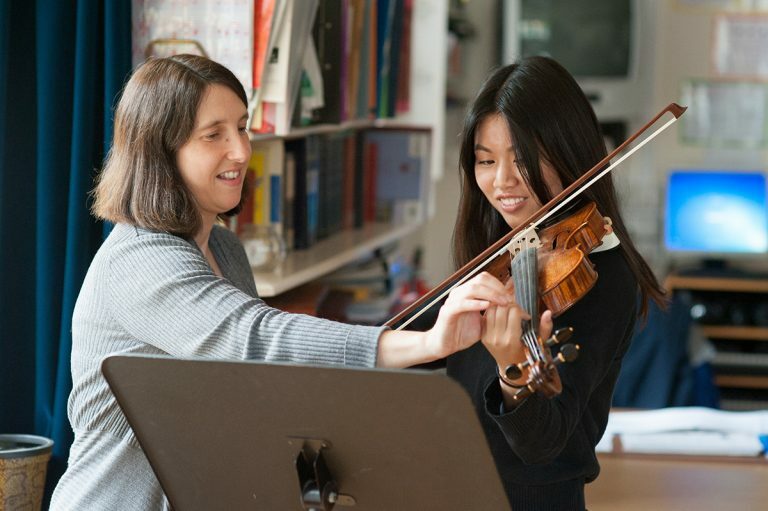 To study A Level, you must play or sing at Grade 6 level and have achieved a grade A or above at GCSE Music. Candidates study the Edexcel specifications at A Level. For the BTEC, no prior study of the sector is needed, but students should normally have a range of achievement at level 2, in GCSEs or equivalent qualifications including music. Students must also be learning a musical instrument or taking singing lessons at grade 4 standard or above. As at GCSE, the A Level course has three parts: Performing, Composing and Appraising. For composing, pupils must complete two compositions. One is free choice and the other is to a brief that assesses compositional technique. The appraising examination lasts for two hours. Candidates study six areas of study, with three set works in each area. The areas of study are: Vocal music, Instrumental music, Music for Film, Popular music and Jazz, Fusions and, finally, New directions. For first teaching in September 2018. It should be noted that the course specification has yet to be released by Edexcel, so the details below may be subject to change. The music BTEC courses are for students wanting to continue their education through applied learning, and who aim to progress to higher education and ultimately to employment, possibly in the music sector or in the creative sectors as a whole. The music industry currently supports more than 117,000 full time jobs in the UK and contributes £4.1 billion to the UK economy. BTEC courses carry UCAS points and are recognised by higher education providers as contributing to admission requirements to many courses, if taken alongside other qualifications as part of a two year programme of learning. The requirements of the qualifications also mean that students will develop the transferable and higher-order skills that are valued by employers. The Pearson BTEC Level 3 National Foundation Diploma in Music: Equivalent to one and a half A Levels. Students also choose one option unit. The option units have been designed to support progression to more specialist music courses in higher education and to link with relevant occupational areas such as composition, business, technology and performance. Students also choose two option units, both of which have been designed to support progression to more specialist music courses in higher education and to link with relevant occupational areas such as solo performance and live event management. The BTEC National music courses offer an exciting opportunity to focus on practical music and to develop an understanding of the music industry. I would be delighted to welcome students onto the course. Photography is offered as an option at A Level. Girls will need their own SLR camera preferably digital with a UV filter. A fee of £50 is added to the school bill at the end of each term to cover the cost of materials etc. Component 1 – Coursework – The aim of this unit is to ensure that students develop an understanding of the expressive nature of the formal elements within photography and film. The possible range of practices might include: comparing, criticising, describing, collecting, investigating, analysing, evaluating, assimilating, exploring etc. Students will develop a personal response to a theme. They work sequentially through a series of ideas towards diverse personal outcomes and a well-considered conclusion or conclusions. Component 2 – Externally Set Assignment (only taken by students taking the AS Level qualification) – Students will be given a preparatory period for the controlled test. They are given a theme with possible starting points and are required to develop ideas, research, make connections to other photographic artists and develop a personal, coherent response from the given theme. There is an 10 hour timed element, in school hours, under exam conditions, in which they must produce their outcome. Students are also required to keep and develop a work journal for each unit throughout the AS course and into A Level. Component 2 – Externally Set Assignment – Students must submit for assessment unaided work produced under examination conditions in a period of 15 hours. The journal, preparatory work and unaided work in this final unit will show the extent to which they can use the skills and the language of the subject that they have developed throughout the course. A Level PE is offered as an option for those which have a keen interest in sport and who wish to extend their understanding and skills in all forms of physical activity. Students receive a well-rounded and full introduction to the world of PE, sport and sports science. This complete grounding in the subject provides an excellent base from which to build when moving on to higher education, employment or further training. Students can develop a range of practical skills, including communication using appropriate language, dealing with pressure, split second decision-making, analysing and evaluating performance, and more. Related career paths that could be followed are Sports Science, Sports Psychology, working in the fitness industry, coaching or teaching Sport and PE, Performance Analysis, Physiotherapy, Nutrition and Sports Development. Plus written/verbal analysis of performance. At this level students are highly encouraged to be participating in their chosen practical activity at a good standard, which should take place outside of school at a club or recreational activity. Physics is offered as an option at A Level. 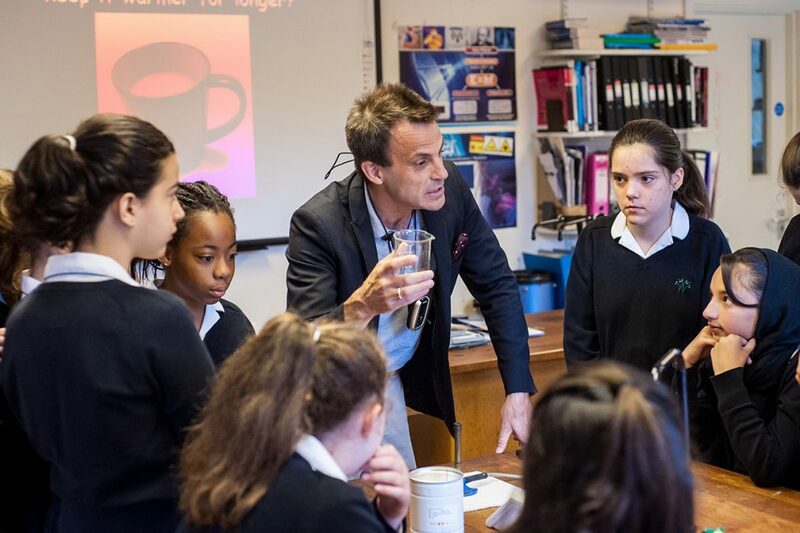 At Wychwood, physics is delivered by specialist teachers in a way that engages and challenges the girls. The main aim of A Level physics is to encourage girls to develop an interest in and enthusiasm for physics. Along the way they will develop an appreciation of how society makes decisions about scientific issues and how science contributes to the success of both the economy and of society. In Year 12 students study mechanics, electrons, waves and photons and practical skills in physics. In mechanics girls will develop knowledge and understanding of the key ideas used to describe the motion of objects, understand the implications of several forces acting on a body and the applications to engineering and design, be aware of how the principle of conservation of energy can be applied to many situations, from rollercoasters to construction, as well as developing analytical and experimental skills. In electrons, waves and photons, candidates will understand how models and theories have changed and developed with the understanding of the electron, be able to build electric circuits and understand their uses and applications, deepen their understanding of waves and become aware of the concept of wave particle duality, develop an understanding of quantum physics and an appreciation of the role of symmetry in nature. The practical skills are assessed in the written examinations, but candidates are still expected to carry out and pass a series of endorsed practicals. These will test their ability to design and carry out safe experiments, to analyse and interpret data, recognizing correlations and causal relationships and on their ability to evaluate methodology and resolve conflicting evidence. In Year 13 students study the Newtonian world, fields, particles and frontiers of physics and practical skills in physics. In the Newtonian world candidates will discuss the use of models in explaining the world around us and understand why Newtonian physics does not apply to situations involving speeds close to the speed of light. They will understand how theories are proposed and developed and apply Newtonian mechanics to the behaviour of gases. In fields, particles and frontiers of physics candidates will further their knowledge of electric and magnetic fields, investigate atomic theory, its applications to radioactivity and explore the possible viability of nuclear fission and fusion as ways of meeting the demand for electricity in the future. They will explore the application of physics to medical imaging and explore models of the universe, its possible origin and future. In the second year the practical skills endorsement programme continues and candidates will be expected to extend their ability to both carry out experimentation and analyse data. Why should I study Physics? Studying physics will provide girls with a rich experience allowing them the exciting opportunity to understand the physical world and the secrets it holds. Psychology is offered as an option at A Level. This is examined in three papers. Paper one focuses on research methods. This component develops knowledge and understanding of planning, conducting, analysing and reporting psychological research across a range of experimental and non-experimental methodologies and techniques. Students carry out their own small-scale practical activities. Paper two focuses on psychological themes through core studies. This paper Introduces some of the central areas of investigation in psychology organised in ten key themes, each represented by a classic and a contemporary core study. The core studies reflect the contribution of psychology to an understanding of individual, social and cultural diversity. There is one compulsory section: Issues in mental health. A Level psychology works really well in combination with a wide range of subjects. For example those hoping to study medicine might find it a useful fourth subject alongside biology, chemistry and mathematics. However it also combines very well with a wide range of subjects in the arts and humanities eg English Literature; Geography; Religious Studies and Philosophy; Economics and History. Psychology provides insight into human behaviour that inform all disciplines relating to people and society.Students tend to find psychology interesting because they can relate the material to their own lives and experiences and also because it is a subject that involves active participation in planning and conducting studies as well as learning about theories and concepts. Religious Studies is offered as an option at A Level. For the A Level course, Girls will be required to look at the writings of philosophers and theologians and recognise the contribution they have made to the fields of philosophy and ethics. They will learn to present and evaluate different viewpoints and be encouraged to debate, discuss and think through the issues raised. During the course students will be given the opportunity to participitate in day conferences related to the subject areas being studied and they will be encouraged to relate their learning to current affairs and questions of personal significance. Unit H573/01 Philosophy of Religion- Plato and Aristotle; Soul, mind and body; Life after death; Religious Experience; Arguments for and against the existence of God; the nature of God; Religious language; Twentieth century perspectives. Unit H573/02 Religion and Ethics – Normative ethical theories – natural law, situation ethics, virtue ethics; Applied ethics -Sexual ethics, euthanasia; ethical language -egoism, duty, preference; metaethics; Freewill and conscience; Developments in ethical thought. Unit H573/03 Developments in Christian thought – Human nature and purpose of life; the self and immortality; Knowledge and revelation of God; The Bible; Jesus Christ; the challenge of secularism; responses to secularism. The aim of the A Level course is to develop an interest in and an enthusiasm for a rigorous study of religion. It treats the subject as an academic discipline by developing knowledge and understanding appropriate to a specialist study of religion and use of an enquiring , critical and empathetic approach to the study of religion. Textiles is offered as an option at A Level. The A Level course develops further from the GCSE Textile course. Students build on the repertoire of skills, techniques and interests they have already acquired. Students can develop their interests and ideas along the lines of design for fashion, for theatre costume or for surface decoration, as well as textiles within the context of interiors. Central to the course is a commitment to build and develop a core of resource ideas in a wide variety of techniques ranging from Batik, quilting, appliqué, machine and hand embroidery and mixed media contemporary techniques. This central foundation of ideas enables students to develop their final resolved textiles pieces for assessment. The A Level is achieved with students producing 6 units of coursework including the final exam. Throughout the 2 year course students come into contact with working professionals in the field of fashion and textiles by visiting a variety of exhibitions and galleries relevant to their research and also have visiting artists to demonstrate contemporary skills.